Suitable for in-ground pools, all surfaces and shapes, with a 21m cable suitable for pools up to 15×7 metres. The V4 picks up large debri like gum buts, twigs & leaves, and fine debris such as sand and algae and even cleans waterline tiles. The V4 supports spot cleaning via the remote control, and a programmable 7 day timer allows you to set and forget. 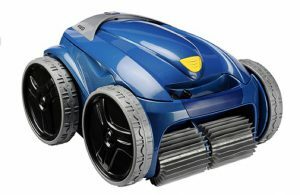 The Robotic cleaner offers low power consumption (less than a LCD TV) and a 2 year warranty.